Instead of spending time trying to "DIY" your electrical work, save time and money by leaving it to the professional electrician at John Julius Electric, Inc in Deer Park, New York. Home and business owners alike rely on us to provide the know-how for anything that has to do with electricity. 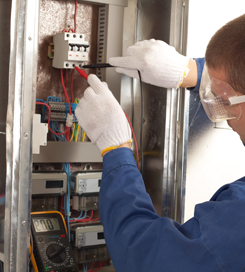 Our team can troubleshoot and repair a variety of electrical problems for everything from pools to houses and buildings. Get more out of your electricity for your home or building with our 20 amp and 200 amp upgrades. These upgrades use energy more efficiently, which means lower energy bills for you. Sparks can fly at any time, and when they do, don't leave it up to chance. Call John Julius Electric, Inc right away. Our emergency services are available 24/7. Customer satisfaction and safety are our priorities, which is why we do what we can within your budget. You'll find that our prices are competitive.